Dr. Bill Bryant is a native of Wayne, Maine. 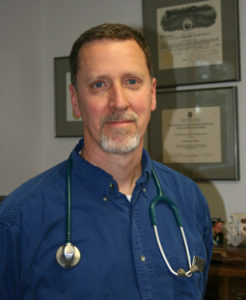 His undergraduate degree was received from the University of Southern Maine before obtaining his Doctor of Veterinary Medicine from North Carolina State University in 1991. After working in large animal medicine and surgery in North Carolina, Dr. Bryant returned to his home state in 1992. Dr. Bryant is a member of the American Veterinary Medical Association, American Animal Hospital Association and the Maine Veterinary Medical Association. He served on the MVMA board for 5 years and as president in 2004. He received the MVMA Service Award in 2005. His medical areas of special interest include arthroscopy and orthopedic surgery. Dr. Bryant lives in Mount Vernon with his wife Patty. Other family members include his daughter Gillian who lives and works in the Durham, NC area, and son Sam who lives and works in Chapel Hill, NC. Dr. Mary Sheridan is originally from New Jersey and her first degree from Middlesex College was in Marketing Art and Design. She worked in advertising as an Art Director for two years before returning to school to pursue Biology. She received her B.S. from Portland State University in Oregon. In 1996 she earned her Doctor in Veterinary Medicine from Kansas State University. Following graduation she moved to Maine and joined the staff at Winthrop Vet Hospital. 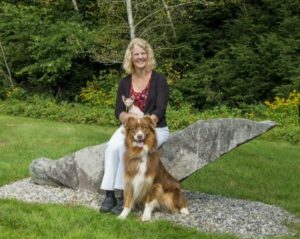 She became an active member of the Maine Veterinary Medical Association and served as its president in 2003. After seven years of practice she left WVH to pursue an interest in emergency medicine and critical care and joined a 24-hour emergency hospital. She moved to North Carolina for two years and continued to gain extensive experience in internal medicine and surgery. In 2006 the allure of Maine pulled her back north and she rejoined her friends at WVH and became a partner with Bill Bryant. Her husband, Matthew Crane, is the Assistant Head of School for Advancement at Kents Hill School. They live in Wayne with their son, Finn. They are owned and adored by a Toy Poodle named Winston and a Labradoodle named Lucy. When she gets spare time again she hopes to return to Community Theater. Dr. Marie Barengo is originally from Connecticut and received her B.S. in Psychology from Fairfield University. After graduation she worked in the Neuropsychology Department at M.I.T. for several years before enrolling in veterinary school. 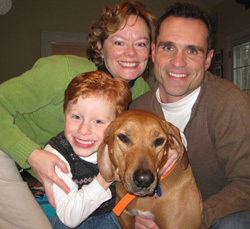 She graduated from Tufts University School of Veterinary Medicine in 1992 and practiced in Massachusetts until relocating to Maine, her husband’s home state, in 2003. She joined the team at WVH in 2013. She serves on the Board of Directors of the Kennebec Valley Humane Society and is Chairman of their Medical Advisory Committee. In addition, she is a member of the American Veterinary Medical Association and the Maine Veterinary Medical Association. Dr. Barengo’s interests include the integration of Chinese medicine (acupuncture) with traditional Western medicine. She has completed both the Small Animal Acupuncture and Advanced TCVM Diagnostics and Acupuncture course at the Chi Institute in Florida. She and her husband Peter reside in Readfield with their dog Quinn and 5 cats: Nellie, Valla, Buckaroo, Lucky and Rosebud. Dr. Colette Bonte was born and raised in Moline, IL. After working in the veterinary field for a few years, she earned her B.A. in Speech Communications and French from Augustana College. Upon graduation, she relocated to Maine and worked first at the Maine Forest Products Council, then several years as the Associate Director of Admissions and Records at the University Maine at Augusta, all the while working part-time in veterinary medicine. She returned to school in 1997 to pursue her lifelong interest in veterinary medicine. In 2006 she received her Doctor of Veterinary Medicine from North Carolina State University and promptly returned to her adopted home state. She joined the staff of WVH shortly after graduation and has been a great asset to the team. 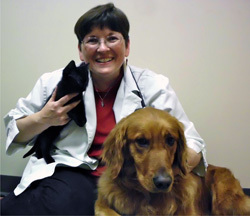 She is a member of the American Veterinary Medical Association and the Maine Veterinary Medical Association. Dr. Bonte’s veterinary interests include animal behavior and geriatric medicine. She currently lives in Litchfield with her 4 cats Mickey Mouth, Pixie, Bear and Lucy. Dr. Shannon Bennett is originally from Clemson, South Carolina, and decided to be a veterinarian at age 9. She studied Biology and Spanish at the University of South Carolina and graduated from the University of Georgia College of Veterinary Medicine in 2006. In 2007, she moved to central Maine. Enjoying the variety of both soft-tissue surgery and internal medicine, her focus is integrating allopathic Western medicine with Traditional Chinese Medicine to prevent and treat disease. Her practice approach is to partner with the patient’s family to tailor treatments uniquely suited to their circumstances, with the option to include herbal medicine, nutrition and acupuncture in the treatment plan. Dr. Bennett, a Wayne resident, spends her out-of-office time with her husband, Chris, and their two young sons, Carter and Jackson. Their family includes two entitled, loving cats named Kingsford and Butternut, a rowdy rescue pug named Louise, and Elvis, the extroverted fish. Depending on the season, her spare time is spent gardening, boating, running, skiing and traveling.